LankaWeb – UNP MP Wijayakala wants to resurrect LTTE – send her to Vishvamadu & see how LTTE families greet her! UNP MP Wijayakala wants to resurrect LTTE – send her to Vishvamadu & see how LTTE families greet her! Following the resignation of UNP MP Wijayakala following her public outburst of wanting to resurrect the LTTE, she was asked to resign from her Ministerial portfolio. 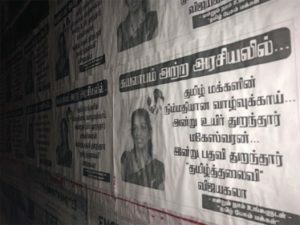 However, there is news of posters being displayed throughout Jaffna in Tamil which translated read this message – Politics without any personal benefits. Maheswaran gave his life for the Tamil people then, Vijayakala gave up her ministerial post for the Tamil people today. She is our leader.” If so, we challenge the UNP to send her to Vishwamadu where the LTTE families & cadres live & see how they react to her as against their reaction to Col. Ratnapriya Bandu crying & garlanding him following his transfer. This will really test whether she is the ‘Leader’ & expose UNP plans to fool the Tamil people by claiming to resurrect ‘Eelam Separatism’ via the LTTE something TNA will also wholeheartedly cling on to since its popularity is also diminishing among the Tamil people by the day. Playing separatist, ethnic politics cannot and does not work all the time. As the saying goes you can fool the people, some of the times but you cannot fool the people all the time. Obviously, UNP is not bothered that its Minister has violated the penal code or the constitution or is unashamedly claiming that she wants a terrorist group back. What is poignant & shocking is that the call to bring back terrorism is coming from the UNP. We are used to & have come to ignore the separatist calls of the TNA knowing too well that the TNA is itself failing the very people TNA claims to represent & the Tamil people are slowly coming out in protest against TNA. Therefore, the UNP strategy must probably now be to take over the baton of separatist racism from the TNA hoping to cash in on the votes that TNA are likely to lose. This certainly explains the posters now displayed throughout Jaffna as a psy-ops to again fool the masses. Elections are around the corner. For starters everyone including some UNP MPs were shocked at Wijayakala’s outburst but with the posters now emerging we have to seriously wonder whether the stunt was pre-planned for the UNP to take over the eelam sing-song & win votes! So let’s put the UNP to the test. Vishwamadu is where former LTTE cadres & their families live. Actually several villages around Kilinochchi gathered to throw a very sentimental & lavish farewell not to a TNA MP, not to a UNP MP but to a Sri Lankan ‘Sinhala’ soldier. That’s not all, every LTTE cadre, members of their families lined up to actually cry over his departure. They carried him lovingly, garlanded him with flowers & bid a farewell that must have made every TNA member, every LTTE Diaspora member & the UNP frothing mad. The photos that emerged automatically made people question – what is going on, when not a single LTTE cadre garlanded or cried for Wigneswaran, Sivajilingam, Sambanthan or any academic in the Jaffna University lighting candles for LTTE dead, why were LTTE cadres treating a Sinhala soldier like a demi-god? Col.Ratnapriya has commanded the respect & love of the LTTE cadres so now that the UNP Posters claim Wijayakala is suited to lead & that she wants to resurrect the LTTE – let’s put her to the test & see how these LTTE villages greet her. Let us see if they afford her the welcome that they gave to a Sinhala soldier! This would be the test for not only Wijaykala, but the UNP & the TNA or even the JVP which held their May Day rally with the TNA in Jaffna recently. All are out to again fool the people. The Tamil people must awaken to realities. They have lost entire generations to war. While Wijayakala’s children are obtaining foreign education the Tamils must ask why should only their children end up with an AK 47? It is the same with the JVP too…. they enjoy brainwashing university youth & stall them from passing out & progressing in life. People must now be a little more intelligent & refuse to fall prey to these political tactics & manipulations. If politicians want to start terrorist movements or wars, tell them to take the gun & do so, why should they outsource that task to other people & enjoy life of luxuries after cunning making other people fight. People must now refuse to pawns of political ploys. As UNP is now gearing up for the elections by strumming the racist song, eelam theme & return of the LTTE – it is time the Tamil people in particular the former LTTE & their families gave them a big thumbs down. Send Wijayakala to Vishwamadu & let us see if UNP can pull off another racist stunt! We should not mix up two different things. Army officer Ravipriya’s facilitation by Tamils must not be construed as rejection of Tamil Eelam (and parties that support it). His success was due to the acceptance of these differences and not pushing our political views on them. The popular army officer was appointed in 2011 and he served there for a long time. People in the area loved him which was a sight to behold. But their first love is Tamil Eelam supporting politicians! This is the 2018 election result of Puthukuduiruppu of which Vishvamadu is a ward. TNA, UNP and a pro-TNA Independent Group swept the poll with separatist parties totaling 91%, If Sirisena’s SLFP (which wants a confederated constitution) is also added, then it is 99% (SLPP and JVP managed to win a total of 1%). Watch this Video. This ordinary citizen says it all!